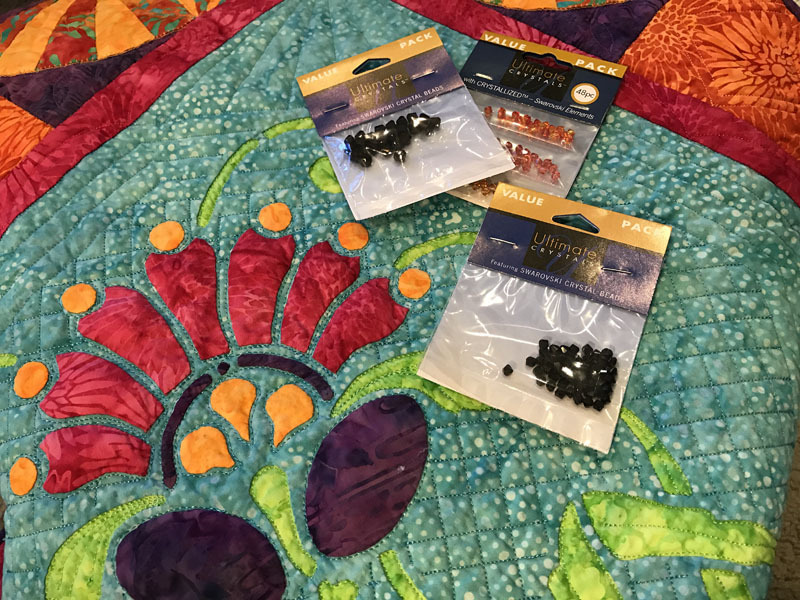 Be empowered, learn and explore creative possibilities as you make the fantasy mini-quilt, Amidala’s Flower mini-quilt X (28” x 28”). 8 fun-filled Saturdays from March – November of 2018. You choose your method. Make it by hand or machine using Eye of the Beholder’s easier methods of reverse applique and applique as you make the center flower block. Learn how to machine embroider as you make the 4” butterfly corner blocks. Refine your piece-work making the 16- fan blocks and constructing the borders. Learn tips for creating a quilting plan to augment all the elements of the design. Explore embellishing with Swarovski crystals. It’s fun and easy to reverse applique and applique with Eye of the Beholder Quilt Design’s Trace, Baste, Snip & Stitch process for hand and Trace, Snip, Iron & Stitch process for machine. Our hand process gives you great control over your piece, allowing you to have sharp points, crisp corners and graceful circles. And by machine? Let us walk you through tips for getting evenly stitched circles and clean, crisp inside and outside points. Whatever process you choose, you will love the results you get. No special machines needed. Then learn and play with Sew Downtown’s embroidery machines as you create the 4” butterfly corner blocks. You can make your own or Sew Downtown will make them for you to stitch into your quilt. Again, no special machines needed. Step by step, Month by month and start to finish, you will see Amidala’s Flower mini-quilt X come to life! **Read the blog “Embellished Amidala’s Flower” (5/19/17) on www.eobquiltdesign.com for a dimensional version of this mini-quilt.